Building quality USB flash drives are a standard thing for SanDisk. The company has long been taking pride in itself for constantly developing some of the latest in flash memory technology. It seems that SanDisk may have found another gold mine in the form of its new flash drive, the SanDisk Extreme USB 3.0. The SanDisk Extreme USB 3.0 flash drive is another one of the company’s products that feature quality construction and a higher than average performance. Offered in a matte black finish with a glossy push button, the flash drive has a retractable USB connector design that keeps the most important part of the drive (aside from the flash chip itself) from going through unnecessary abuse. Though it isn’t one of the biggest in the largest, the SanDisk Extreme is fairly large in comparison to other USB flash drives. It’s twice as long as a normal USB 2.0 flash drive and a bit wider than standard, which can be a problem if you have to plug in another USB device to the port next to it. Its size can be explained by the USB 3.0 design requirements, which bulks up some flash drive dimensions because of the hardware inside. On the upside, the drive only weighs in at 12 grams, making it one of the lighter USB drives in the market. 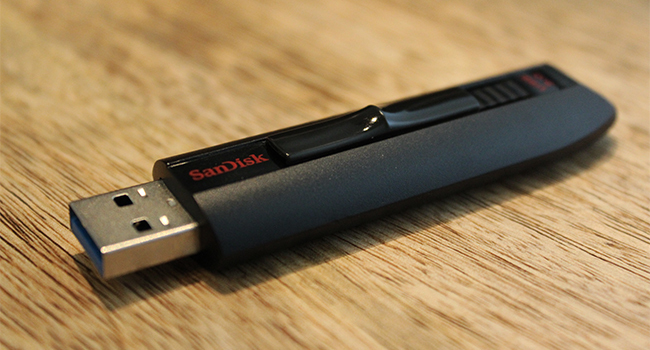 Getting down to the performance side of things, the SanDisk Extreme doesn’t disappoint. Marketed as having the capability to transfer data in rates of up to 190 MB/s, repeated real life testing reveals an average ranging from 50 to 60 MB/s, and a top record of 196 MB/s reading speed and 62 MB/s writing speed have been noted. Despite the considerable gap between the marketed speed performance and the average results, the SanDisk Extreme is still fast. How fast? Twice as fast the top speeds of USB 2.0. To assist in securing the flash drive’s data, SanDisk outfitted it with a password protection system and 128-bit AES encryption. The flash drive is also backward compatible with USB 2.0 and comes with a lifetime warranty. The SanDisk Extreme USB 3.0 retails at $25 for 16 GB, $40 for 32 GB, and $83 for 64 GB. Do you think it’s worth the price? Let us know what you think! This entry was posted in SanDisk, USB 3.0 Flash Drives and tagged SanDisk, SanDisk Extreme USB 3, USB 3.0, USB Flash Drive. Bookmark the permalink.